Please join us at Unreal Survivors for an evening of Food Fight! Countdown timer: Food Fight Night! The games will be DM and Burger CTF! Regarding Burger CTF, in a nutshell a Burger spawns in the middle of the map. You need to take it (makes you fat) and touch the enemy flag. Its a GREAT fun game if you haven't tried it yet. Please connect on to the server before the night if possible so that you can get all downloads done. 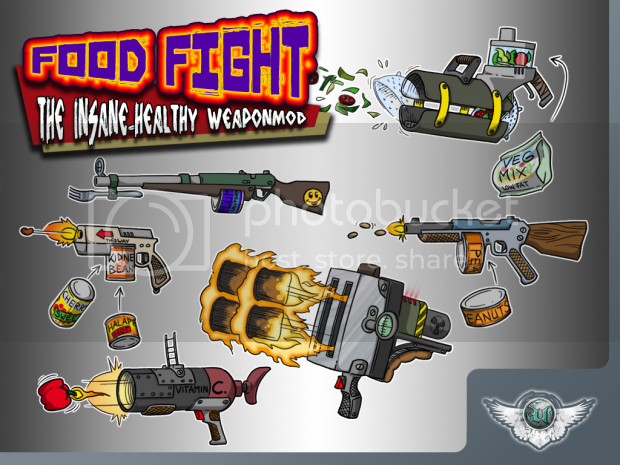 Feel free to test it all out and get familiar with the insanely healthy weapons. Last edited by Pileyrei on Mon Nov 06, 2017 8:30 pm, edited 10 times in total. papercoffee wrote: here Here HERE!!! Just a little reminder about our food fight night this Wednesday. I'll be teaching at that time. Carbon wrote: I'll be teaching at that time. Make a surprise test ...and during your students are sweating and are concentrated can you play on a laptop some Food Fioght. I'd love to join! I hope I do not forget. Sign me up, I'm not present then I forgot. Terraniux wrote: I'd love to join! I hope I do not forget. Sign me up, I'm not present then I forgot. Reminder - Food Fight night is TONIGHT! Pileyrei wrote: DING DING DING! Wanted to test the settings but can't connect. I'm home soon and will check the server over. Pileyrei wrote: What happens when you try? Nothing happens... and after a few seconds a note that I couldn't connect. Init: WinSock: Socket queue size left as default. ScriptLog: PitF Skrilax tskmskins. tskmskins. If I connect to the server I am very short on in but I can't play, then the server seems to crash. Some minutes later it is back again. No error messages or ACE issues shown. papercoffee ands alderbaran - please try again. I just removed ACE temporarily for tonight and rebooted the server.